Zavižan is one of the best-known localities in the Northern Velebit National Park. Located at 1594 m above sea level, underneath the Vučjak peak, is the mountain hut Zavižan and the oldest high-altitude weather station in Croatia, established in 1953. Since Velebit forms a natural border between continental and Mediterranean regions of Croatia, two different climates clash at its uppermost parts – the maritime and the continental climates - resulting in unpredictable weather conditions. This makes the Zavižan weather station invaluable to the meteorological community. The Zavižan mountain hut was built on the foundations of Krajačeva Kuća (Krajač's house), which dates back to 1927. The Krajačeva Kuća collapsed during the Second World War, and in 1951 the Croatian Mountaineering Association, supported by mountaineers from the town of Senj, started the construction of a new mountain hut which was open on 27 July 1953. The Zavižan weather station has for three generations now been staffed by the members of the Vukušić family, who in addition to being meteorologists are performing the job of mountain hut caretakers. Thanks to them, the lodge is also open in winter. Easy accessibility, the existence of a hut and other facilities (parking, sanitary facilities, benches, rest areas, etc.) make Zavižan a very good point of departure for mountaineering tours of Velebit. If you climb up one of the mountain paths that lead to the surrounding peaks – lookout points – you will be rewarded by spectacular views of the Kvarner islands and Lika. The scenic vistas provided by the group of Zavižan peaks (Veliki Zavižan 1676 m, Balinovac 1601 m, Zavižanska Kosa 1620 m, Vučjak 1644 m) are sure to take your breath away. Zavižan is most easily reached from Babić Siča, the main entrance to the Park, from the direction of Oltari and Krasno. 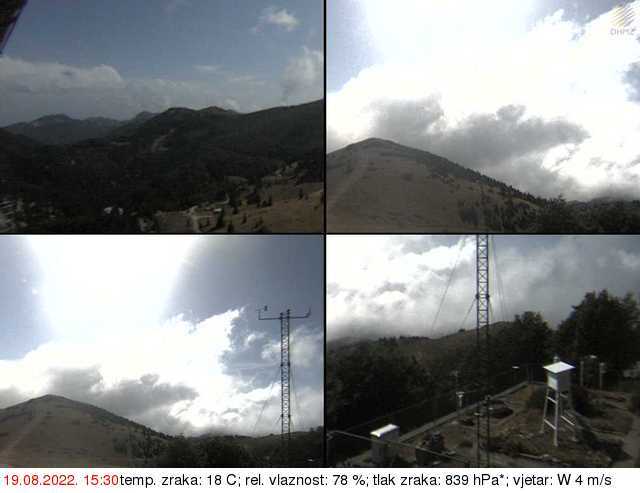 Web camera is located at the mountain hut Zavižan.